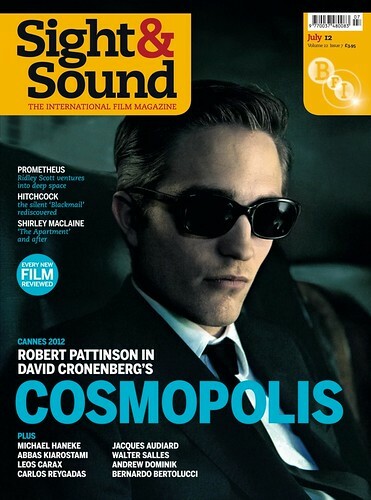 July 2012, originally uploaded by Sight&Soundmagazine. Thirty years ago, explosive body parts were what the directors of Alien and Scanners had in common. But while Ridley Scott reaches for the stars with his ‘origin of everything’ epic Prometheus, David Cronenberg has gone the other way, shrinking his universe to the inside of a limousine in Cosmopolis. The latter was a star attraction – and one of a cavalcade of auto-themed works – at this years Cannes Film Festival, from which our editor Nick James and Geoff Andrew report. And while that round-up looks forward to 20 films that’ll be coming the way of our arthouse screens over the next 12 months, we’re also looking back this month: over the careers of the late, great Japanese director Shindo Kaneto and the redoubtable Hollywood comedienne Shirley MacLaine, to Hugh Hudson’s 1980s epic Revolution and to the greatest of all British silents, Hitchcock’s Blackmail. With its enigmatic tale of a stranger shaking up a small town on the fringes of Turkey, Kosmos confirms Reha Erdem as a director of mysterious vision, whose characters move beyond language. By Trevor Johnston. Subscribe and get a free BFi DVD!